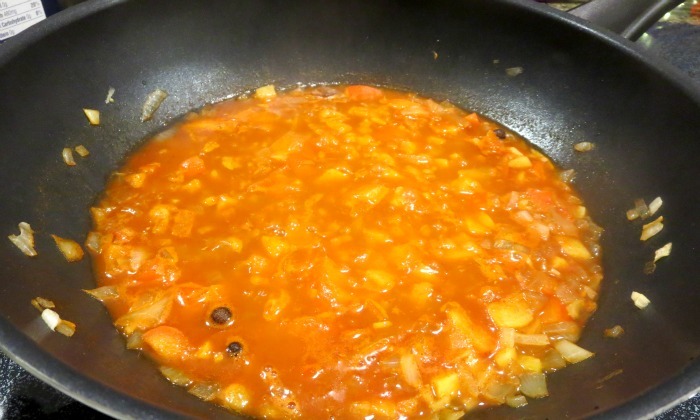 Our pick of the week for "Cook Around the World" was Ethiopia. 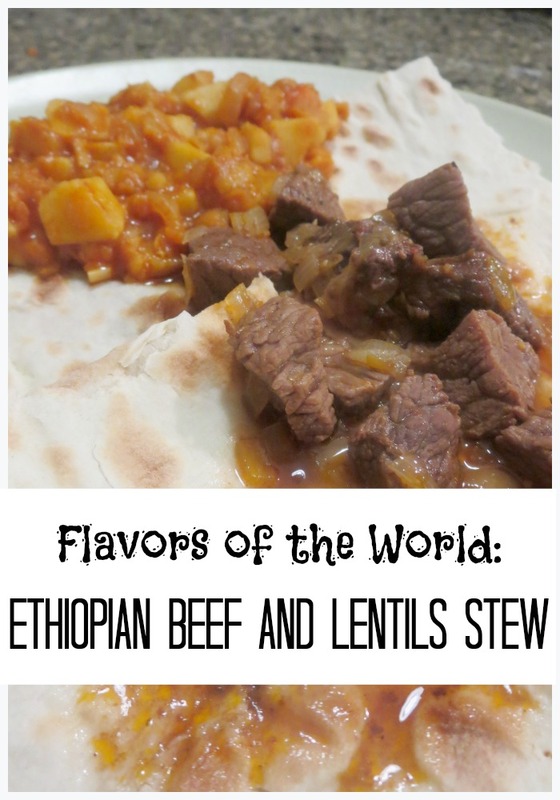 We created a unit study about Ethiopia first and prepared a delicious Ethiopian dinner - spicy beef stew (Key Wat) and red lentils with sweet potatoes. 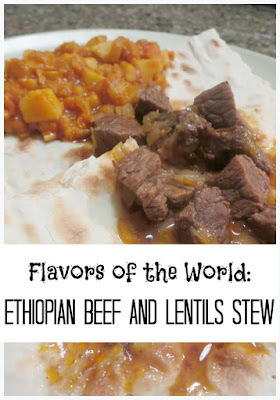 I wanted to make a complete Ethiopian dinner that my somewhat picky eater would enjoy. At the same time I wanted it to be different from what we usually eat. 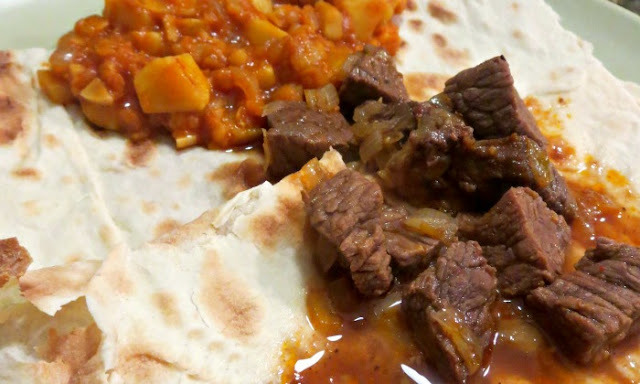 My compromise was to have beef (which happens to be my daughter's favorite meat) as the main ingredient and a side dish with lentils (arare sight in our house) served on top of a flat bread. Traditional Ethiopian bread is injera made of a local low-gluten Ethiopian grain called teff. We replaced it with lavash bread, which is not the same, but was much easier to find in our local Mediterranean store. After some search and consideration I picked these two recipes, both from Food.com. 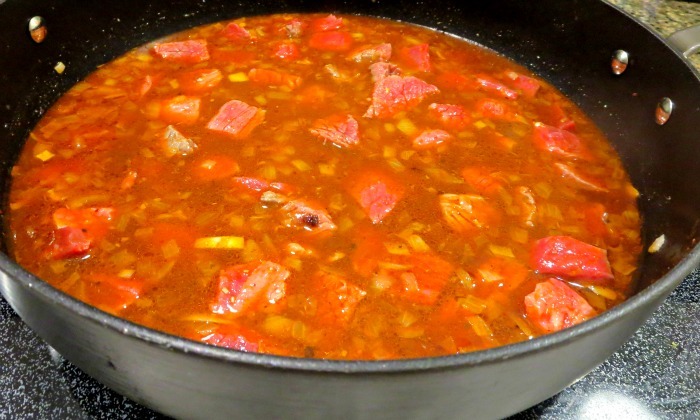 The recipe has a section on making Berbere spice, but we already mixed up a batch of Berbere spice with somewhat different ingredients while learning about Ethiopia, and we just used that mix in the recipe. We followed the rest of the recipe exactly but used regular butter (not ghee) for frying meat. We all enjoy sauces, but next time I would probably use a little less beef stock, since we ended up with some extra soup-like sauce in the end. I suspect it was because I had less than 1.5 lbs of beef to begin with, but did not adjust the rest of ingredients for less meat. The original recipe is small, and I doubled everything to make about 3-4 portions. We ended up using sweet potatoes and not yams, because I knew that my daughter likes sweet potatoes in stews. We did not have fenugreek, so I ended up skipping it altogether, and I used allspice berries instead of ground allspice (I took them out before serving). I was somewhat worried that the dish would be too spicy for my family, but I was wrong. My husband and daughter loved it, and there was nothing left for leftovers. Smarty begged to make it again, which is a very high mark of approval from her. The preparation time is a bit long (about 90 minutes total), but I am definitely adding this dish to our "special dinners" collection. I am just starting this series, so for now just follow my Flavors of the World Pinterest board! This sounds delicious! Pinning to hopefully make for my family soon. All of our attempts at African meals did not go well. Their spice palette is sufficiently different from what we eat, that everyone was looking at it weirdly.